I have given you My Spirit, so your body could be My temple. 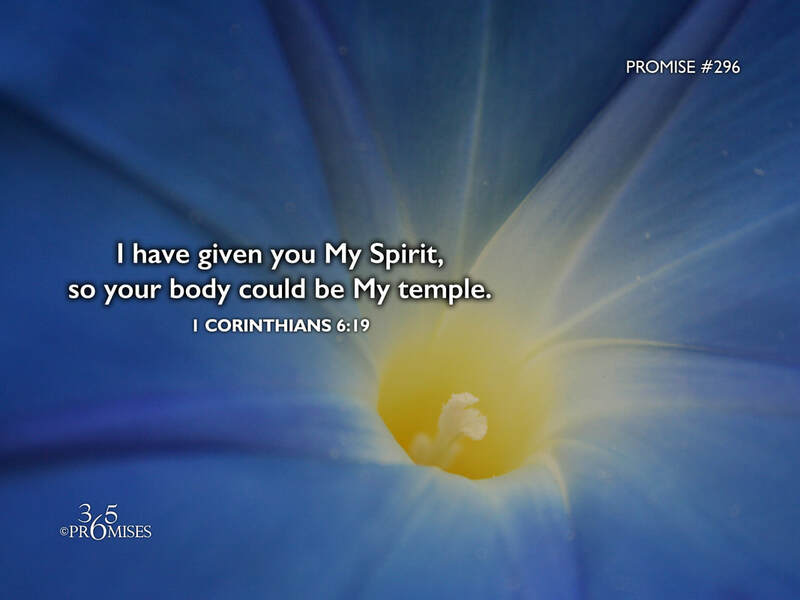 God's Holy Spirit is the very core of His being, just like our spirit is the very essence of our existence. It is amazing to think that He has entrusted us with His precious Holy Spirit. It amazes me to think that we could be the resting place for the living God. Today's promise tells us that we belong to God and He delights to rest upon us. In the Old Testament, we read about the Holy Spirit coming upon people at certain times, but in the New Testament there is a whole new level of interaction with the Holy Spirit that we have a privilege of knowing. He lives in us. In John 14:23, Jesus said that not only will the Holy Spirit live in us, but Jesus and the Father would too! There is no greater honor that we could receive other than to be the temple of the living God. I pray that each and every one of us would take a moment right now and thank God for trusting us with His presence. May we never take His indwelling for granted!